Elle Garner is a writer, optimist, health enthusiast, wife and mom. She uses her love for writing and health as a catalyst to write about topics she is passionate about. She believes achieving health, vibrant energy, a positive life, AND a healthy weight is easier than you think! It's her mission in life to make a difference every single day. THE LAST WEIGHT LOSS BOOK YOU'LL EVER NEED! If you need to shed weight in a safe, effective, and lasting way, this is the book for you! Unlike many fad diet programs that starve you in order to lose weight, Choose Thin uses a proven approach that works with what you are already eating! Do you struggle to lose weight and keep it off for good? This book will change that. Based on 10 PROVEN Secrets to Permanent Weight Loss, the author used these specific 10 Proven Secrets to lose 40 pounds - and then kept it off for good (more than 20 years!). In Choose Thin, she shares all. If you're concerned about the impact of water quality on your health, and you want to know the secrets and benefits of drinking pure water, how you can get pure drinking water easily and cheaply, the impact of hydration on mental and cognitive functioning, and what water does inside your body - then you're about to discover all of that plus more energy and improved health! In fact, if you want better health, improved performance, or need to lose weight, then this new Ebook - "Drink Pure Water" - gives you the answers in 12 information-packed chapters, and answers important questions and challenges we all face with respect to finding and drinking pure water. - How can I get pure water inexpensively? - How can drinking pure water improve my performance? - How can drinking pure water help me lose weight? - How can drinking pure water improve my health? - What does water do within my body? - How does dehydration impact mental and cognitive function? So, if you're serious about wanting more energy and improved health, or you want to know how water can improve your performance, or realize a healthy weight, then get a copy of "Drink Pure Water". Health enthusiast, Elle Garner, will reveal her knowledge of Pure Water and how drinking it can benefit you - Today! It's more important than you may think. Drinking water is among the most important things we can do for ourselves and our health. 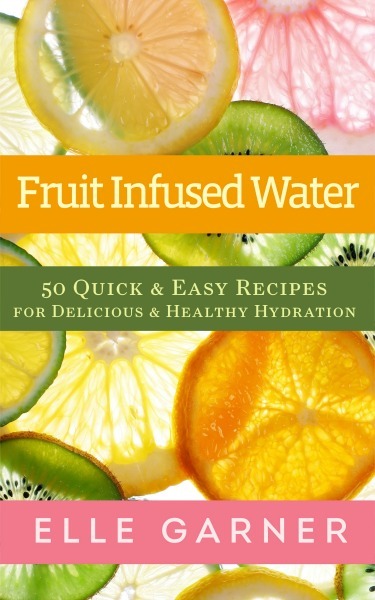 That's why Fruit Infused Water: 50 Quick & Easy Recipes For Delicious & Healthy Hydration is packed with simple recipes that you can make easily, quickly, and drink every day. We all need to drink more water, and now you don't have to dread drinking tasteless and boring water. In under 60 seconds, these recipes empower you to create a healthy, delicious, satisfying, and refreshing option with significant savings over commercial options. If you’re one of the millions who have given up on drinking water, or simply don’t think you can really drink 8 or more glasses per day, Fruit Infused Water will introduce a new, delicious, and quite simply a better way of getting the water your body needs for life…daily. Fruit Infused Water was created to help you drink more water! With 50+ recipes and simple variations, this book will help you see that drinking water is too often defined by what you give up (taste) when it is really about what you'll gain: health, vitality, energy, and healthy water that tastes great while satisfying your thirst. These pure, simple, healthy, and satisfying recipes for fruit infused waters can help you keep your energy levels up, help you perform better, and stay healthier. Enjoy a healthy and fresh approach to quenching your thirst, hydrating your body. Drink More Water. Drink to your health!